Although culinary gymnastics has been his forte for 60 long years, Chef Dr. Publis has tasted the most unpalatable of life’s offerings yet remains aloof of all traces of bitterness which to any other may not necessarily be so. As he sat with me recently at the BMICH eastern wing facing the sprawling lawn and a setting sun calling it a day, Publis at 84 contradicted every step of the way the socially designated sunset years. Not for him the arm chair, walking stick, elder’s home and all else that usually accompanies the onset of advancing chronological years as he grapples with the onerous task of looking after the evergreen grand old dame - the Mt. Lavinia hotel where he made his debut as ‘charcoal boy’ only to end up as its Executive Director along a not so rosy path. Fortunately for him, a magnimous father /son combo at the helm cushioned him through those thorny years depositing him into the administrative hot seat he so richly deserves that casts a doubt on professionalism elsewhere needless to speak of labour exploitation. So Publis went in straight to the kitchen gave the bottle only to realize even after days there were no signs of him being called. “So I went again to this fellow and told him if he wouldn’t give me the job, to return the arrack bottle.” Having been told to fly a kite he managed to work out a letter through a relation from the nearby parish priest and interestingly when the bottle failed it was God almighty that worked. But even that was short lived. “I assumed duties but suddenly on that day itself I was asked for a cessation of duties. I ran to the Time Keeper and insisted I would not move until I was given the reason to stop work.” He took Publis to Resident Manager Gunatillake who informed him that his uncle was guilty of misconduct and there was a petition requesting him to remove Publis immediately. “So that was my uncle and not me,” retorted Publis. Way back in 1956 Publis’ salary was a monthly princely Rs. 40. “What couldn’t you do with 40 rupees in 1956?” Then came diversification of the culinary palate with Indian and Chinese cooking that brought him dividends as the entire kitchen department was brought under his wings. Folding up his debut performance as charcoal carrier lasting 3 years, Publis took to his new role with much enthusiasm and ease. It was tough cooking on a daily basis in the absence of cold rooms unlike now. All weddings in those days had short eats and one could imagine how tough it was for Publis without cold storage nevertheless a challenge to bring to the forefront his latent culinary skills without putting himself into cold storage! From then it was one straight drive of uninterrupted success at the hotel of which Publis himself has now become an institution. Adding to his numerous achievements is his first ever publication on Sri Lanka’s vast spread of fruits and vegetables. Food value, nutrition content of what to consume and avoid aligning with body chemistry among other things comprises the Mahasupavamsa written by Dr. Publis. It comes at a time when western cuisine is progressively gaining control of the once indigenous Sri Lankan palate. The foreign culinary invasion of what is local range from western pizzas; short eats to the Indian kottu, naan and chappatis, Chinese rolls not to forget the Spanish tortillas and American mayonnaise sauce. Our preference of diversity in food, clothing, culture and language is remarkable except when it comes to Northern devolution of power if not for which the ethnocentric politician will lose his vote base. So the rata, jatiya, aagama cry is political monopoly of the nationalists’ palate despite accommodativeness, diversity and inclusion displayed in all other existential states including food. The ‘redda hetta’ has ceased to be and girls opting for western attire while men are fascinated with sartorial elegance if elegance would have it what with a tie knot that resembles more like a frog far removed from the days when this writer’s father was all spick and span with an elegantly knotted tie which did justice to his western attire and striking personality. In his writings Publis is also not unmindful of minority food habits as well which keeps him off the narrow jingoistic enclave enabling his book an all inclusive endevour. 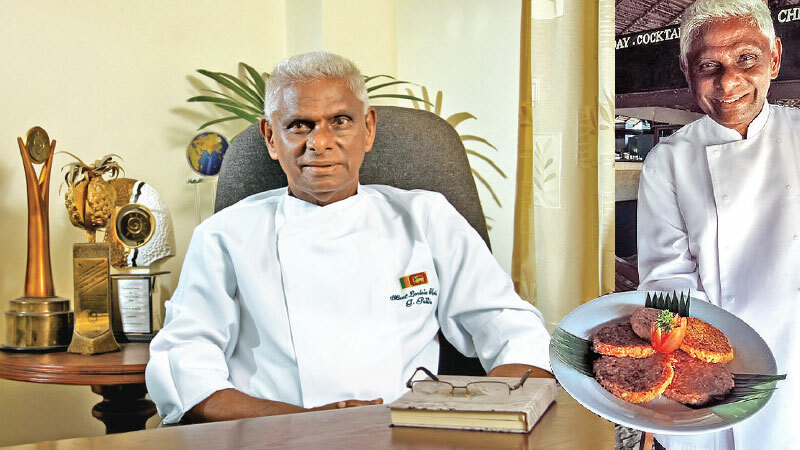 The Mahasupavamsa’s high point is the renewal of the ancient Sinhala food chain– much of which has fallen into a grand historical past what with burgers, pizzas, pastas and coke dominating the Sri Lankan food palate. Surprisingly the ancient Sinhala people have had to their now defunct indigenous knowledge a range of chemical free food preservatives as well. The Mahasupavamsa fulfils a great void in bringing out the best in Sinhala culinary delight, now regretfully gone into oblivion. It also reveals how health conscious the early Sinhalese were in being selective about the types of food that went into their system unlike today. The writer recalls in some book the early Sinhalese who ate only what was ‘hela avulu’ or Elavalu which was proof to their vegetarian diet – ‘hela’ being Sinhala and ‘avulu’ meaning food. Little wonder then how receptive they were to the very noble Buddha expression of ‘siyalu sathvayo niduk wethwa nirogi waywa’ for they abhorred eating fish flesh and fowl while wishing them health and happiness. Dr. Publis unfailingly makes reference to food of the early Sinhalese contributing to maintaining emotional stability and well being besides the maintenance of physical health. Certainly the research done in bringing out this masterpiece is not to be treated lightly. To say the least it is no doubt a marvel and the book can stand on its own without political introductions. A firm believer in cooking with love, Publis says it is such a mindset that brings out the best in any dish. One’s thought waves get into the food. If you cook with anger so be it. The often heard social expression that the cook may have been in bad mood when the curry tastes bad confirms Publis’ belief. So it is important to be happy when cooking. It is to this writer’s knowledge that even out there in the Himalayas the great rishis and yogis keep stirring the cauldron welcoming every visitor with a smile and the food cooked with an internal dimension filled with all that is positive is a great celebration to the palate.